WHAT IS A MEXICAN CASSEROLE? Full disclosure, Mexican casserole is not something you’re going to find in Mexico. It’s a completely Americanized dish. In American cuisine, calling a recipe Mexican usually means there’s cumin, chiles, and tomatoes. Or the good old American favorite: taco seasoning. A casserole is food cooked in a dish in the oven. Usually there is a bit of liquid, mixed with meat, vegetables, and a starch. As the liquid evaporates in the heat of the oven, all the ingredients come together into one cohesive dish. Casseroles are typically cooked in a large dish, called a casserole dish of course! They can also be made in an oven proof dish of any size. 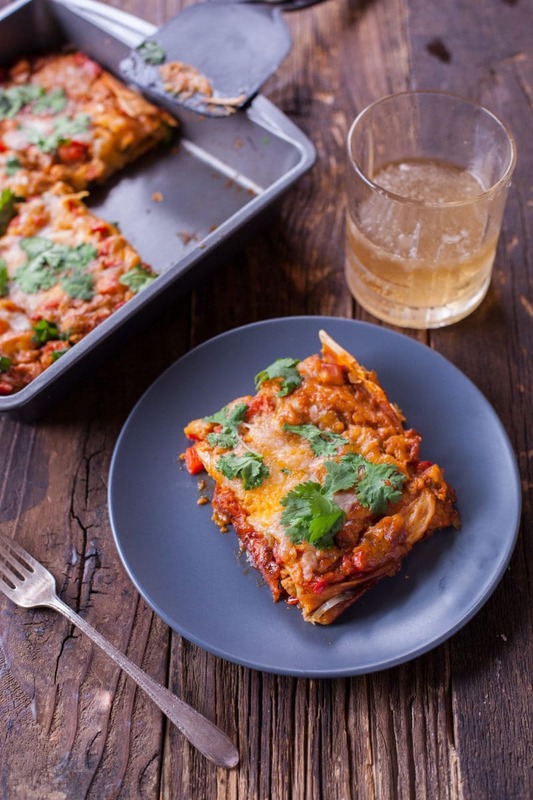 Like this low carb Mexican casserole which is in an 8×8 baking dish. It’s the start of January and lots of us are focusing on healthy eating after an indulgent holiday season. I don’t know about you but I ate ALL the Christmas cookies. I just had a baby, and all I wanted was carbs and fat. But now it’s been a few weeks, and I am trying to get back to healthier eating habits. Because I LOVE Mexican food, I was looking for a healthy Mexican casserole to make the family for dinner this week. 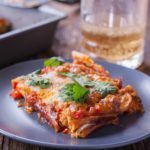 While I found lots of low carb Mexican casserole recipes, all of the recipes were laden with fat and still pretty high in calories. This might be fine for people on a keto diet, but I’m trying to eat a little more balanced. Low carb doesn’t always mean healthy. So here is a healthy Mexican casserole recipe made with chicken breasts, fresh vegetables, and my favorite low carb tortillas. For those of us who love sandwiches and burritos (whoop whoop! Raise your hand! ), it can be tough to satisfy those cravings in a healthy way. One day I gave my assistant some tortillas I’d picked up from Walmart. She was making a big batch of breakfast burritos for a photo shoot. I was at the computer when I received an excited text message from her. She and I had both recently started Weight Watchers (this was before I got pregnant). I hadn’t even thought to check the points for the tortillas. They were for a work assignment, and I just assumed I wouldn’t get to eat them because, well, they’re tortillas! 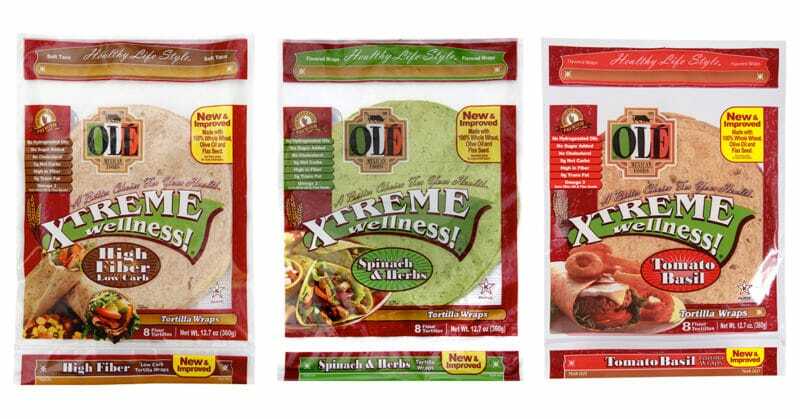 But these Xtreme Wellness tortilla wraps from OLE Mexican Foods are high in fiber and low in carbs! With just 5 net carbs per tortilla, I’m having one every day for sandwich wraps, burritos, and even baked into chips. And of course, they’re perfect for a low carb Mexican casserole. 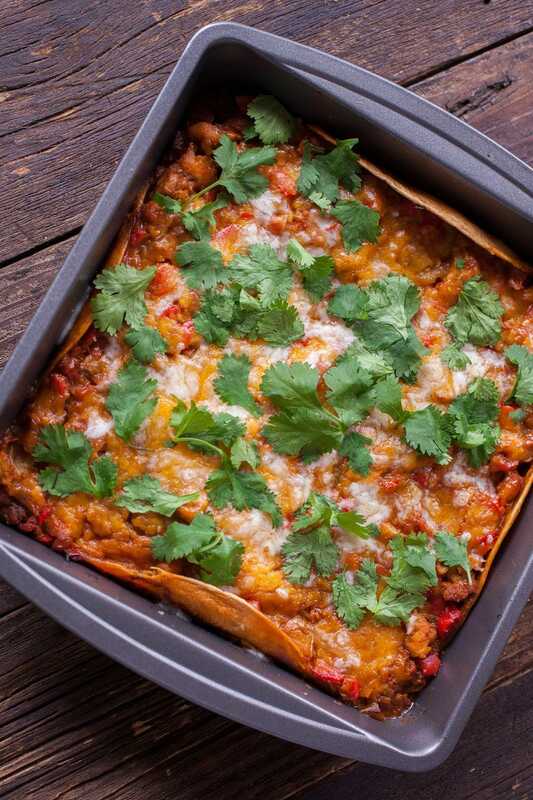 HOW DO YOU MAKE MEXICAN CASSEROLE HEALTHY? The first step to making this Mexican casserole healthy is the low carb tortillas. But there are several other ways to lighten up your casserole. By using cubed or shredded chicken instead of ground beef, you get the protein benefits with a lot less fat. This can be a great way to use up leftover rotisserie chicken breast meat. Just skip the cooking time for the chicken in the recipe and add the veggies immediately. 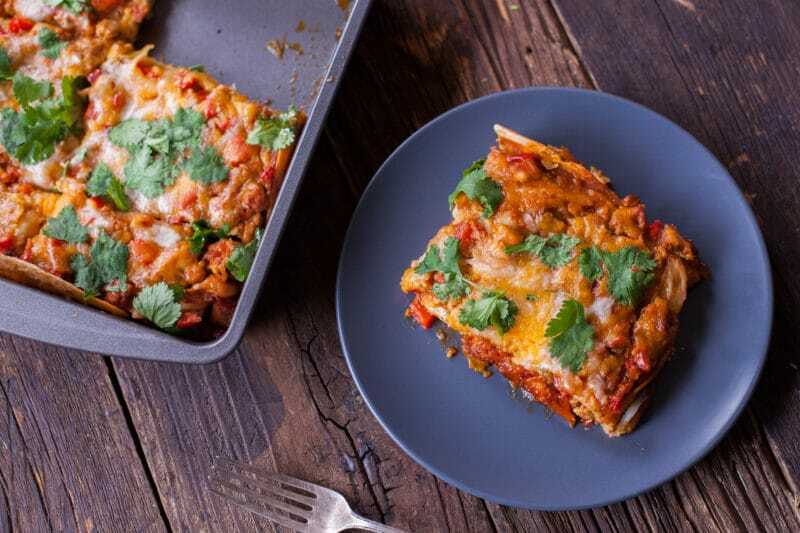 Our healthy Mexican casserole is also packed with veggies. And the diced tomatoes, red pepper, onion, and chilies cooked in chicken stock make an amazing sauce. 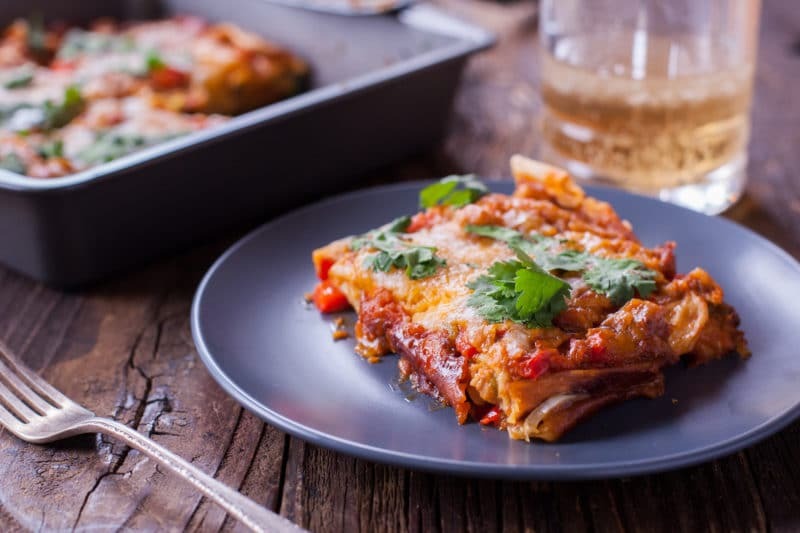 Other Mexican casseroles often have you use a canned enchilada sauce which can have added starches, sodium, and oil that you don’t need. 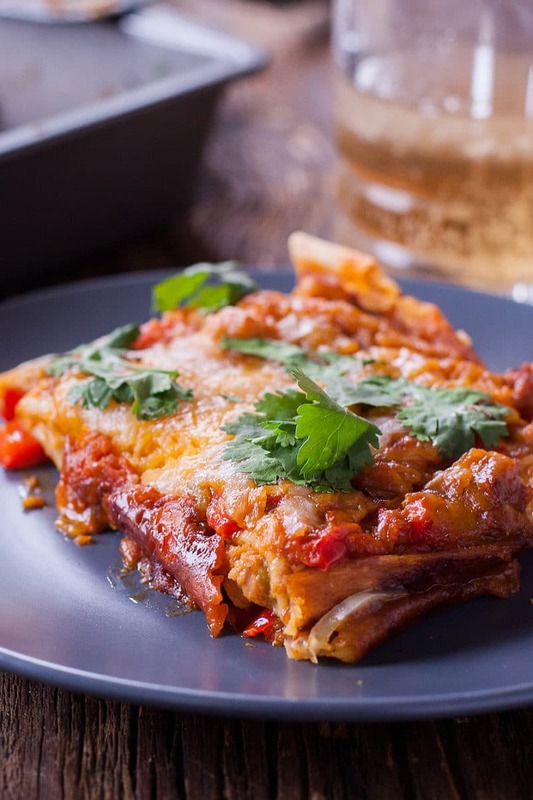 Another option to lighten your Mexican casserole is by using a low fat cheddar. I prefer to use the good stuff, especially since there’s only one cup of shredded cheese in the whole recipe. Finally, we make this low carb Mexican casserole six servings with a side salad or roasted vegetables. It would be easy to split it four ways and eat more, but learning portion control is part of a healthy lifestyle. A big side of veggies is a great dinner habit to get into. As always, healthy means different things to different people. Check the estimated nutritional information in the printed recipe to see if this meal fits in your healthy lifestyle. Heat a teaspoon of oil in a large nonstick skillet on medium high. Add the cubed chicken breasts and garlic. Cook, stirring, until chicken is just starting to brown (If using leftover rotisserie chicken, skip the cooking and proceed to next step immediately). Mix in finely chopped red bell pepper, diced tomato (canned or fresh), diced red onion, cumin, chili powder, and salt. Cook 5 minutes until red pepper and onion are slightly softened. Mix in a small can of diced green chilies, and a cup of chicken broth. Cook about 5 more minutes until the liquid is almost completely evaporated, then remove from heat. Spray an 8×8 or 9×9 baking dish with cooking spray, then place a low carb tortilla in the pan. Top tortilla with half the chicken and veggies, and ½ cup of shredded cheese. Add a second low carb tortilla and top with remaining chicken and veggies plus another ½ cup of shredded cheese. Bake for 15 minutes until the cheese is melted and the tortilla edges are crispy. Want to make your Mexican casserole in advance and freeze it? Line your baking dish with foil before using it. Layer the ingredients as instructed (spray oil, low carb tortilla, chicken and veggies, cheese, low carb tortilla, chicken and veggies, cheese) and cover tightly with foil. Once frozen solid, you can remove the foil wrapped casserole and return it to the freezer without the baking dish. When ready to heat, place foil wrapped casserole back in baking dish. Bake at 350 degrees F for 20 minutes (covered in foil). Remove the foil and bake another 15 minutes until cheese is melted and tortilla edges are crisped. 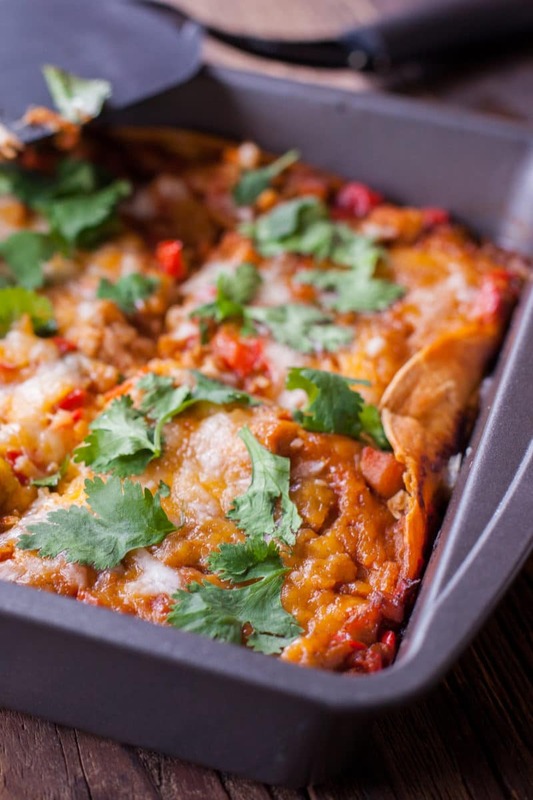 Don’t lose this healthy Mexican casserole recipe! Pin to save the recipe, then add a photo to the comments of the pin when you make it. We love to see your creations! If you’re a fan of Mexican food but watching carbs or calories, you’ll love this Low Carb Mexican Casserole. The casserole is also low in fat, with just 4 WW freestyle points per serving! You can reduce the points even more by using low fat cheddar, but I think the good stuff is worth a couple extra points. Used with permission from Genius Kitchen. In a large nonstick skillet, heat oil on medium high. Add the chicken breasts and garlic, and cook for a couple minutes until chicken is just starting to brown. Add the bell pepper, tomato, red onion, cumin, chili powder, and salt. Mix well and cook about 5 minutes until vegetables are slightly tender. Pour in the chicken stock and chilies. Cook another 5 minutes until stock is almost all evaporated. Spray an 8×8 inch baking dish lightly with cooking spray. Place one tortilla in the bottom of the pan. Top with 1/2 of the chicken and veggies, then sprinkle with 1/2 cup of cheddar cheese. Place the second tortilla on top and spread the remaining chicken and veggies over it, then sprinkle with remaining cheese. Bake for 15 minutes, until cheese is melted and tortilla edges are crispy. Sprinkle with fresh cilantro (if using) and slice into 6 pieces. This can also be a great way to use up leftover rotisserie chicken breast meat. Just skip the cooking time for the chicken in the recipe and add the veggies immediately. KETO BAKED CHICKEN RECIPE LOW CARB AND SATISFYING! I had some leftover chicken breast cut up and this was the perfect way to use it up! Such a delicious casserole, thanks!